And a lot more capacity is on the way, with no visible effect on Henry Hub prices. US exports of LNG continue to rise as more capacity comes on line and plants run above baseload, the US Energy Information Administration (EIA) said in its weekly report January 17. It sees exports peaking at times of peak demand, with less LNG leaving the country in spring and autumn, but the surge has had little impact on Henry Hub month-ahead prices so far. The price of the 12-month strip averaging February 2019 through January 2020 futures contracts is still – just – below $3/mn Btu. In November and December last year it broke consecutive monthly records with 32 and 36 cargoes exported, as new trains at Cheniere Energy's Sabine Pass and Corpus Christi facilities began production in late November. 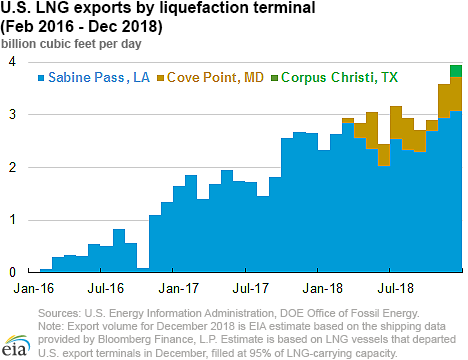 EIA estimates that US LNG exports averaged 3.6bn ft³/d in November and 3.9bn ft³/d in December, based on the vessel shipping data provided by Bloomberg Finance. December's volume is equivalent to 40bn m³/yr. US exports from the lower 48 states – in other words excluding the small Alaskan plant at Kenai – began in February 2016, at Sabine Pass. Since then it has grown to five trains. Dominion Energy's Cove Point LNG export facility started up in Maryland, and Corpus Christi Train 1 began LNG production several months ahead of schedule in December. Existing US LNG nominal baseload liquefaction capacity is estimated at 4.25bn ft³/d and peak capacity is at 4.87b ft³/d across seven trains at three liquefaction terminals. Once the remaining facilities under construction – Elba Island, Cameron, and Freeport – and the remaining two trains at Corpus Christi are placed in service, EIA estimates that US nominal baseload liquefaction capacity will stand at 9.6bn ft³/d and peak capacity at 10.7bn ft³/d (or 80.9mn metric tons/yr), the EIA said. EIA estimates that Sabine Pass facility has been running above 100% of its nominal baseload liquefaction capacity in the winter months and near 100% of its baseload capacity in the summer months once the new trains at the facility have been fully ramped up. In winter 2017–18 Sabine Pass operated at an estimated 107% of the nominal baseload and 92% of peak capacity; in the summer 2018 this was 97% and 83%, respectively. For the whole of 2018, Sabine Pass utilisation is estimated at 106% of the baseload and 91% of peak capacity. Cove Point terminal also ran above 90% of its baseload capacity in November–December 2018, with an overall use of 67% of baseload and 62% of peak capacity since the facility started operation in March 2018.